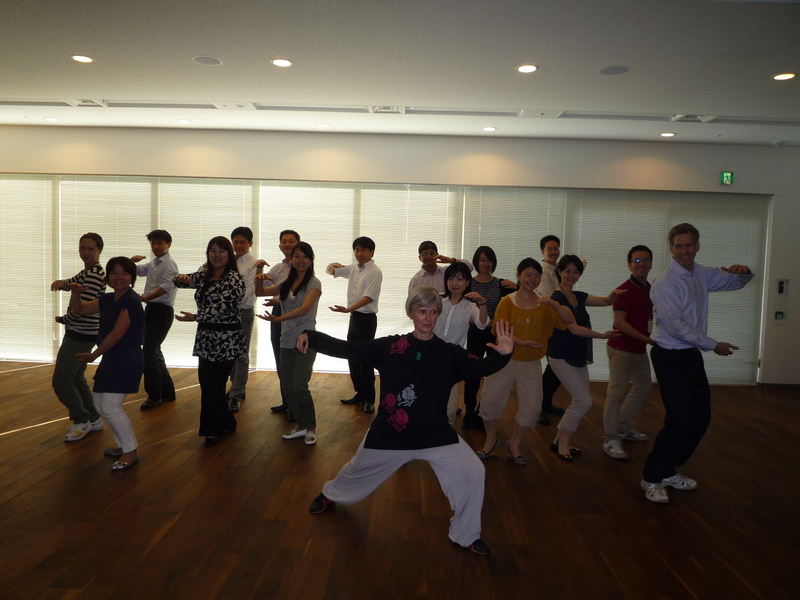 I have been invited by General Electric Japan to give a demo class of Tai chi. The company wanted to provide relaxation classes to the staff and last Wednesday GE celebrated the World’s Health Ahead day, providing Yoga, seminars on supplements and nutrition, and Tai chi. There were almost twenty people joining my class. They followed me diligently for one hour, practicing Chi Kung and Tai chi. When I showed them the self defense applications of the main stances we were studying, most of them were so surprised! They did not know that Tai chi was a martial art and they were even more surprised by how hard it is to practice the basic walk in Tai chi, moving from one “Bow stance” to another. How can Tai chi “relax” if it engages so many muscles? And why is Tai chi called “walking meditation”? When we think to relaxation we think to “collapse” on the couch, doing anything. This can help for awhile, but afterward we feel still exhausted because we haven’t really relaxed. Through Tai chi we basically lower our energy stuck in the “head and heart” complex to the lower body. Afterward we feel relieved, fulfilled, rebalanced and deeply restored: this is relaxation. Focusing on our posture, balance and coordination breaks the cycle of toxic, recurrent thoughts. One can think that meditation is concentrating on one thought but this would mean again being used by a thought. Meditation, in my opinion, means listening to your body, connecting the mind to the current sensations in your body and breathing correctly and thoroughly, in order to eliminate anxiety (breathing out) and open to life (breathing in). You are very right, Monica. Since I have started with Tai chi, I have been feeling much more relaxed and tuned in to my Self. Love your post! Thank you and congratulations, Sofia. That’s a big achievement, indeed! Your personal achievement. In doing this you make yourself responsible for your own health and happiness!